It's that time of year again my friends, when I wear casual summer-y skirts for a week just for twirly kicks. Last year it was fun, so I thought, "Why not?" and decided to do it again. Annelise has VBS at her school this week so it's the perfect excuse to shower and get myself somewhat together for the day. Why don't I get myself together every day, you might wonder, well...I don't know. It's a struggle. Yesterday I wore a yellow cotton skirt with a black T (I must pause to tell you how much in love I am with the Daisy Fuentes' favorite t-shirts from Kohl's. It's scandalous.) and black flips. Call it my Ode to a Bumblebee Look. 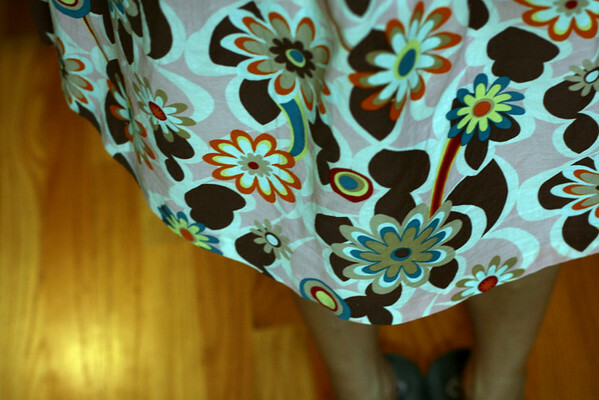 Today I'm sporting this rather loud flower print with a brown T (sadly, NOT Daisy Fuentes) and brown flips. I can't show you my toes because a pedicure is on the agenda for tomorrow, right now they are quite frightening. I'll post Part Two of Op Skirt soonish, you know, after I actually wear them. I haven't done a whole lot of anything productive for the three hours A. is learning about Paul and Rome and the Underground church yesterday and today, but I suppose that is my prerogative. (Who sang that song by the way? Can't think and not inspired to Google right now.) This morning I popped into Academy to get A. 's little uniform clothes for school. I don't know what has come over me, but I feel this strong urge to get everything together and off to the monogram shop really soon. I guess for once in my life I want to do something ahead of time. Strange. Now I must interrupt this ramble for a VERY IMPORTANT QUESTION OF THE FASHION NATURE. M'kay. We are leaving Thursday afternoon for San Antonio and a date with Shamu at Sea World on Friday. Yep, we will be entering one of the realms of Hades, at least temperature wise, in the name of family entertainment and memories. My question is this: what on earth do I wear to look somewhat cute, be comfy, and so that I don't melt completely in a puddle of sweat? I do know I am not mentally prepared for the visual assault of all the inappropriate flesh that I'm sure others will be baring. I don't want to be one of those people, yet I want to follow the Three Cs (Cute, Cool & Comfy). i broke down and wore shorts... and i was glad. a cute top and shorts (and my fitflops, which are my most comfortable shoes!). and of course, after you spend days planning on what you will wear, you will see many people, and wonder how that lady possibly thought that outfit was even bordering on appropriate. you might even have to think it several times. I love the second skirt. Super cute. Will check out the Daisy Fuentes tees, as am always on the hunt for good ones. When we went to Sea World a couple of years ago, I wore a knit skirt from Old Navy with layered tanks over a sports bra. I was super comfy, felt cute, and did not melt. I like a skirt b/c it is longer, so when you sit on the bleachers, your legs don't stick to the seat. Skirts also seem more breathable somehow. I've been wearing the same very casual black skirt around the house every day because it is the coolest (temperature wise) thing I own and the closest I get to wearing shorts. It's part of my very small, frumpy summer collection so I just move forward and do what it takes not to overheat. I love Sea World but would NOT be going there in the full summer heat and humidity of Texas, you're much braver and nicer than me! I would go for the skirt and tank top selection, with a squirt bottle and water bottle on hand and perhaps a sombrero to keep your head covered. Just promise me you'll take a self-portrait if you wear the sombrero! I love Sea World - better than Disney!! When we lived in San Antonio I took the kids at least once a week with our season passes. I'd wear as little as possible - it will be HOT!! I personally just don't do shorts, so for me it would be a toss-up between skirt and tank (cooler than a T) and a sundress. I am partial to dresses because there is no waistband issue. Love this week of skirts post. I distinctly remember it from last year and loved it then, too! I say skirt unless you are getting on all those fast paced rides where it might end with your skirt over head. Also, don't wear a WHITE skirt because Shamu will splash you.....even if you are not in the splash zone somewhere you will get wet. You will be precious whatever you wear. But, go to lots of the shows where you can sit around fans....I wish we were going too! the second skirt is my fav.